I am not always the best at backing things up, but I know it is very important. I am sure you back-up your images and files (right? ), but have you ever thought about backing up your Blogger blog? 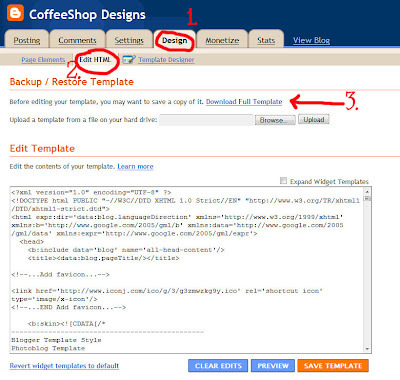 The first thing you should do is save a copy of your blog template to your hard drive. 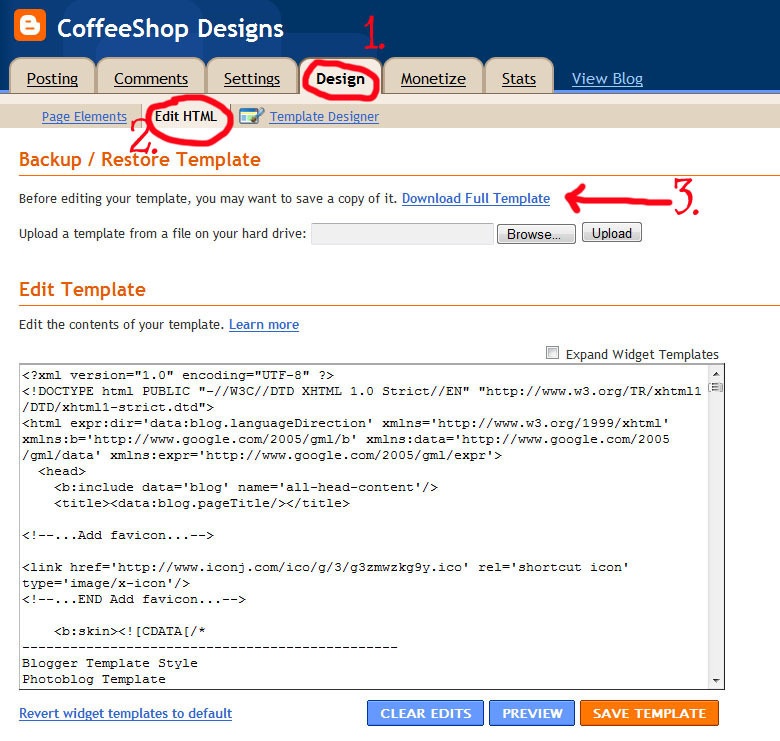 Go to Design, Edit HTML, Download full template. Save this file somewhere you can find it. Always save your template before making any changes to your html. And it doesn't hurt to have a copy just in case you need to start a new blog with that same template. how to do this (thank you google) and wanted to share it with you. We have all heard horror stories of blogs disappearing (google Blogger or WordPress "my blog disappeared" and you will be shocked). Usually these blogs get flagged unfairly and often they are restored, but it doesn't hurt to have a backup on your computer just in case. 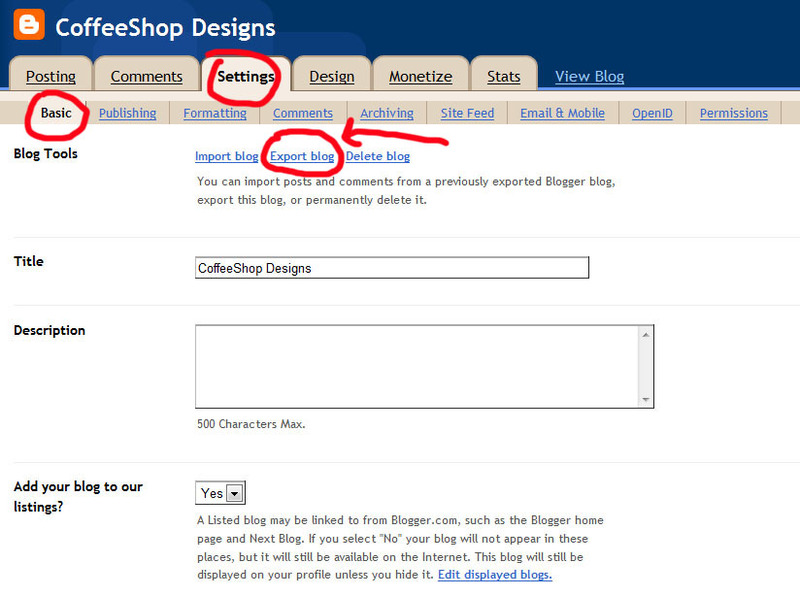 Click on Settings, Basic and then click on Export Blog. Now simply click on Download Blog and save a copy of that file on your computer. I have to confess the first time I did this I was shaking because I was convinced it would delete my blog or export it somewhere in space. I think this is a common fear, read the disclaimer: "Don't worry, your blog will still remain on Blogger until you delete it." 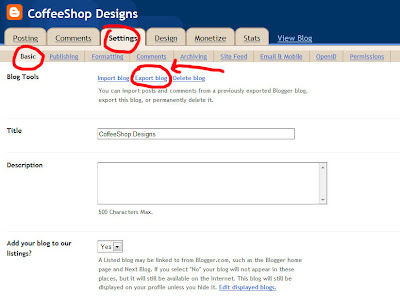 So there you have it, an easy way to make a "just in case" copy of your entire blog. If you are like me and have spent years working on your blog, this will give you some peace of mind. And who doesn't need that. If you are using WordPress there is an official backup service called VaultPress - http://vaultpress.com/ - It's run by Automattic, the same people that started WordPress. It's a subscription service, but have heard good things about them and their customer service. That is crazy because you read my mind today!!! I was searching on how to do this but didn't find this way! I just saved it to my external!!! and wanted to ask your advise on a place to backup my whole computer and my external hard drives??? thanks for the tip ! I'm not under blogger, but under canalblog, so I've to see if I can do the same..I hope ! Great thanks for the advice, I just backed up my blog! Thank you for this. I just backed mine up! And I am glad some people didn't know this also. I have been on Blogger for years and never realized I could do this. Thanks! I used the Export/Import feature when I changed blogspot addresses, but I never thought (yes, my hair is blonde) to use it to actually back up my blog. Thanks! Thank you, it is a much needed thing to do. I am off to do it now. Thank you so much! I can't even imagine how I would feel if I lost all my blog comtent! Thank you so much for posting this! It's so useful. I didn't know how to back up my blog. It's so easy! I just did this, and clicked Open after it saved, and there are no pictures with the text...should there have been? It was an .xml file. Thanks! Julia, your links to your images should be in the code. This method won't back up your images, they are stored on Picasa (if you upload via blogger, otherwise they will have the links to any other image hosting site). But the links to Picasa are there. Thanks so much. I've downloaded my template before but that's it. Don't know what I was thinking. I'm in the process of doing both right now! BTW, I love your blog & your actions! Don't know Alice, on my Mac it goes to downloads.